Featuring new and exclusively commissioned digital art displays alongside emerging talent, light workshops, and legendary illuminations - from local, national, and international artists. 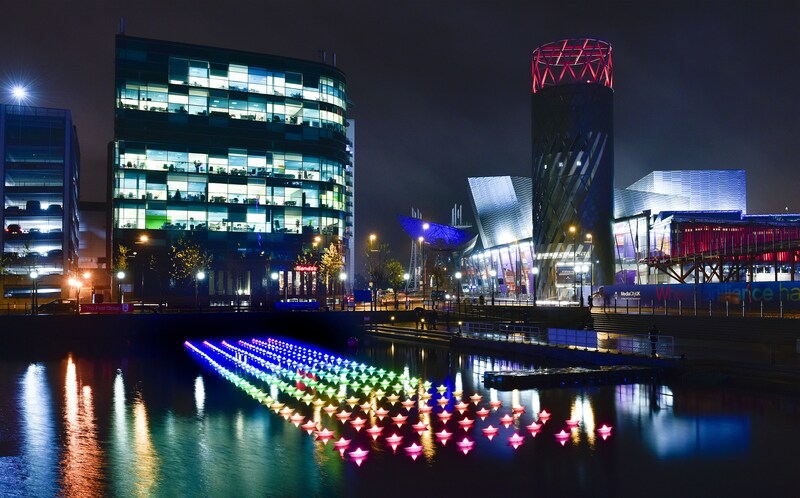 Lightwaves 2016 will bring light to those dark winter nights, as FREE light experiences span across The Quays, from the Plaza between The Lowry and the Lowry Outlet, to MediaCityUK’s Piazza, and even in the River Irwell. A first-time showcase for Salford Quays and MediaCityUK, Voyage is pre-existing artwork, which has been shown globally. 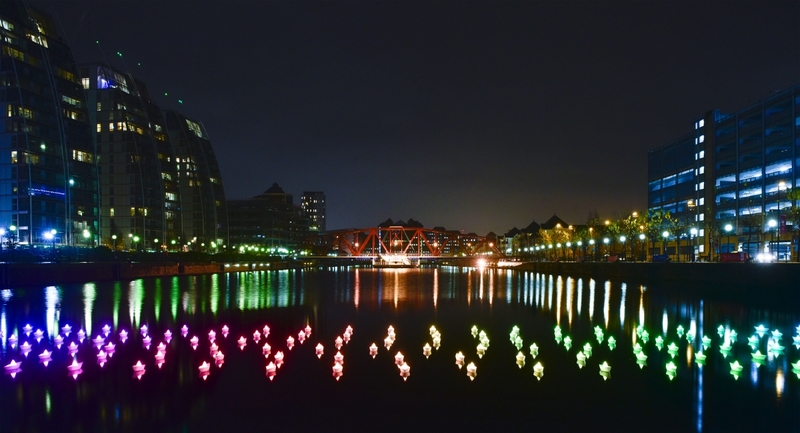 Created by Aether & Hemera – a multi-disciplinary art and design studio, producing contemporary lighting art and interaction design - Voyage features a flotilla of 198 origami boats that were designed to engage with the community and transform the waterfront. The fleet composes an organic matrix of interactive lights, which change colour when passers by interact with it on their mobile phones. The public can transform the pattern and colour of the paper boats by connecting their mobile device to Voyage Wi-Fi network and opening their browser to access Voyage.co.uk; users will be given a choice of artworks to interact with, such as a rainbow or the night sky – choosing an artwork option will change the colour of the boats in the water. 2016 will see Quays Culture collaborate with lighting legends of the North, Blackpool Illuminations. At 10km long and using over one million bulbs the Blackpool Illuminations are an awesome spectacle, which has been running since 1912. Quays Culture will be showcasing items from Blackpool’s light collection, which reflect the location of MediaCityUK, home to the BBC, including Dr.Who Daleks, Phone Boxes, and Spacemen. Quays Culture delivers outdoor arts and cultural events combining the latest in digital technology with the vision of world-class artists throughout the year. Its work ranges from the intimate to the monumental, acting as a series of interventions and invitations to the public realm. Lightwaves 2016 will run daily from 12pm – 10.30pm.